Group members will need to work with their team to to avoid obstacles and collect all of the forks, knives, and spoons. Teams will need to trust one another as they navigate obstacles and other players. Make a large playing area with the rope. Designate three separate areas around the rope boundary for the small groups using tape, cones or more rope. 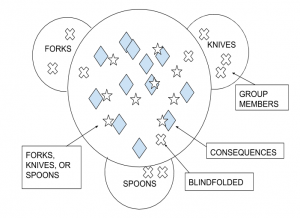 Arrange the ‘consequences’, obstacles, and forks, knives, and spoons (FKS) in the area. Arrange some the FKS so that some are easier to get and some are more difficult. Divide the group evenly into the three designated areas. Note: Be careful not to refer to your groups as teams. This activity is not designed to be a competition though many groups will interpret it that way. Simply divide into the three areas, you may address any interpretations of your rules and instructions during the debrief. The goal of the activity is for groups to clear the area of FKS as quickly as possible. The forks must be returned to one area, the knives to another, and the spoons to the last area. At any time, only one person from each of the three areas may be in the main area. That person must always be blindfolded. The rest of the group may not leave their designated area. The person holding the utensils has to let go of their utensils. All the people in the main space holding utensils must give up their utensils. All the utensils that have been collected (but not necessarily the ones they are holding) are put back in the main area. All the utensils, those already collected and being held, must be returned to the main area. All the people who are currently in the main area must return to their small area (still blindfolded) without picking up any other utensils, and a new person must enter. Safety: No throwing the utensils. Also, be cautious when moving through the obstacles in the playing area. The group may ask three questions. Repeat rules if they ask questions that will give them too much information too quickly. Solution: Each of the groups will either be able to complete the exercise and retrieve all of their objects or they won’t. No matter the outcome you can debrief the dynamics of the team and how they did or did not work together to achieve their end goal. This activity is often challenging for groups – don’t be afraid to regroup or take a timeout if needed. Use a time limit to stop the game if it is running long. To make the activity more challenging, you can tell the group that there are ‘consequences’ but that it is up to them to figure out what items they are in the course. You can tell all three teams that they will be working together to complete the challenge and then provide instructions – this may change the way that groups choose to collaborate or experience conflict.